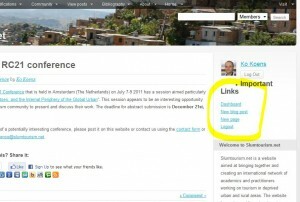 Post on Slumtourism.net yourself – Now easier than ever! It is now easier to post items yourself on Slumtourism.net. If you have reflection on slum tourism that you want to share, know of an upcoming event, have recently published a journal article, have a discussion question, etc. you can post it yourself. When logged in, simply go to the toolbar on the right side of the homepage and click on “New Blog Post”. You can click on the picture on the righthand side see where this option will appear. Remember that it will only show after you have been logged in. This will take you to the to main editing screen (see below). Here you can edit your post using the html editor. When you are done, you can publish it using the “Submit for review” button on the right (visible in the red box on the picture below). Your post will now be send for review to prevent spam and published soon. 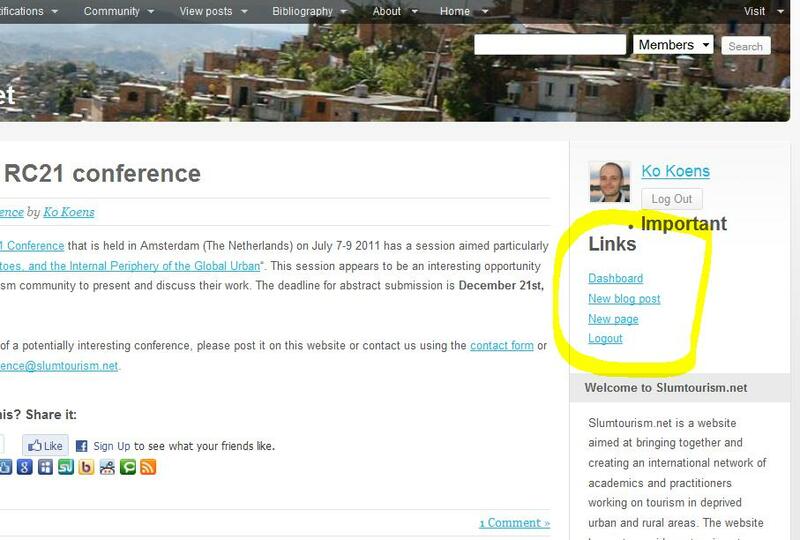 Should you want to, you can choose to add tags and/or place your article in a category. However this is not required to post. Good luck posting. If this is still too much you can of course also send your posts to info@slumtourism.net, or simply comment on the existing posts!